Few know the cold, dark winter days better than the Scandinavians – other than a few polar bears and penguins. So I knew this Swedish snack would hit the spot as a winter lunchtime treat. 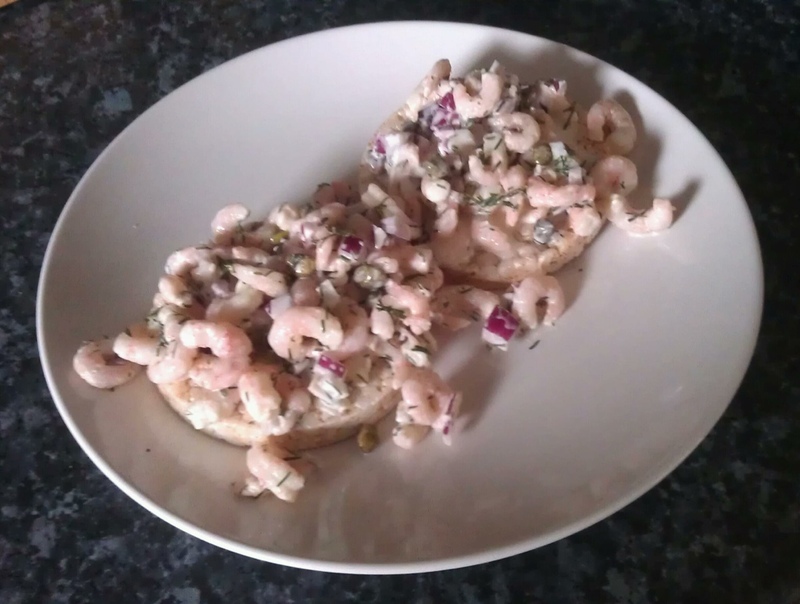 Skagen is a combination of prawns, dill and red onion with a creamy dressing served on toast. To make it a bit more diet-friendly, I swapped the majority of the mayonnaise, sour cream or créme fraîche typically used in the dressing for low-fat yogurt, just thickening with a tablespoon per serving of mayonnaise (otherwise the dressing becomes a bit too runny). And, sacrilege of sacrileges, I eat this delight on rice cakes rather than toast – I know, believe me I’m not happy about it. I would much rather be biting into some warm, buttery toast piled high with prawns, but I will settle for having something piled high with prawns rather than no toast and no prawns. Obviously, you can replace the toast (or rice cakes) with any number of things (Ryvita, lettuce cups, crackers…), as long as it’s a suitable vehicle to enjoy this fishy treat. The prawns are low-fat and high in protein which means they keep you pretty well satisfied and the fact that my normally vegetarian lunch includes meat, especially fish, always seems like a special treat. The red onion has a lovely raw onion bite and the dill gives the whole thing a really fresh flavor. Sainsbury’s basics frozen, cooked and peeled prawns are only £2 per bag and each bag makes three servings of Skagen making this a really affordable, but luxurious, lunchtime snack. It would work equally well as a starter (obviously not on rice cakes) and you can make it even more luxurious by serving it in the traditional style – with a spoonful of fish roe on top.